This is a great smart bracelet that features 0.96-inch color screen, advanced GPS system, heart rate monitor, activitity tracker, multiple sports modes, smart notification, IP68 waterproof, weather forecast and some other amazing advantages. It is a perfect gift for men, women, and anyone serious about fitness and outsoor sports. Color Screen: 0.96 big TFT colorful display screen, sunlight readable. GPS Motion Trail: Advanced GPS system provides your sports trail and accurate analysis about your activities. 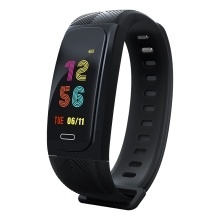 Heart Rate Monitor: Tracks 24 hour real-time heart rate, records sleep, time, distance, step frequency, speed. Multiple Sports: Running, hiking, riding, skiing, mountain climbing, running machine. Smart Notification: Remind you of the incoming calls, messages, App notifications, etc. IP68 Waterproof: Suitable for swimming and snorkeling, not for deep diving. Weather Forecast: Display the weather, temperature, wind speed in the next two days.